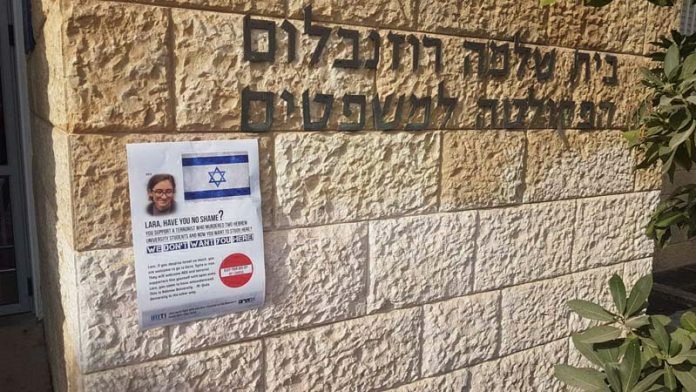 Dozens of anti-BDS and anti-terror posters directed at Lara Alqasem—the American anti-Zionist student leader whose expulsion from the Jewish State was halted by the Supreme Court—were hung and distributed on Sunday at Hebrew University’s Mount Scopus campus, ahead of Alqasem’s arrival. The posters also called attention to Alqasem’s support of Rasmea Odeh, a convicted terrorist who played a key role in a 1969 bombing attack that murdered two Hebrew University students. “You support a terrorist who murdered two Hebrew University students and now you want to study here? We don’t want you here!” read the posters.